[Italy, September 4th 2018] – Experimental activities of the Project Acanto were reported in the local newspaper “Il Ponte”. The publication is an instrument used to inform, confront and start a dialogue between key partners in the community of Pergine and the Trentino region. 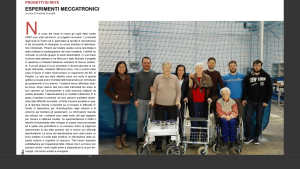 The reported activities were developed with residents of Trento and Pergine during march 2018. “The walker tests were also a good excuse to go out, and to stimulate the motor and cognitive capacities of each one [of the participants]. They have all expressed satisfaction after the experience”.